Years ago, between the ages of 19-21, with the guidance of Auntie I learned to make incredible yeast rolls. After getting to “perfect” with my technique, Auntie warned me that if I ever stopped making them, I would loose the ability. I’m sure that I didn’t believe her because at about the age of 26, I stopped. For the last 7 years, I’ve sporadically tried my hand at everything from simple rolls to raisin bread. Whether I was following a “best” recipe or making them from memory, nothing turned out quite right..until now. 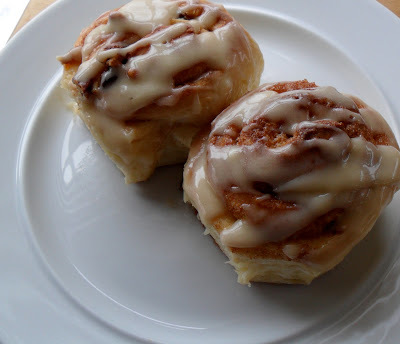 I found a recipe for cream cheese cinnamon rolls posted on Tasty Kitchen by Joy The Baker. After reading the recipe, I was intrigued by the process of working cream cheese into the dough, like butter for croissants. I made them the first time just as she specified and they were great! Remembering Auntie’s warning, practice makes perfect, and because they’re just that good, I’ve made them several times. I’ve also made a few modifications like using more yeast, more vanilla & more sugar. The recipe that I’m sharing is my adapted version. Feel free to click on her link and use her recipe…You won’t go wrong, and she even has a funny story. The baking sheet made measuring & cleanup ultra easy! Rolled up and ready to slice! When dough has doubled, turn out onto a floured surface. Sprinkle top as well and roll dough out to 10 x 10, carefully and evenly spread with 4 ounces of softened cream cheese. 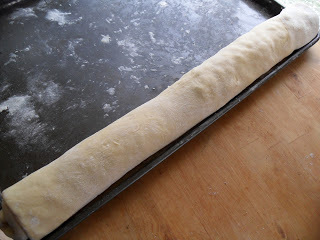 Fold dough over itself into thirds(like you’re folding a letter), then fold in half and roll back out to 10 x 10. Repeat this process twice, some of the cream cheese will break through. Sprinkle dough will flour once more and roll out to 20 x 14. I used a large baking sheet to gauge the size. Once rolled out, carefully spread with 1 stick of softened butter. Sprinkle evenly with cinnamon sugar mixture, followed by raisins and nuts. 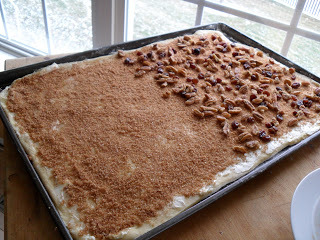 Because my daughter thinks that she does not like nuts or raisins, I only sprinkled them on half of the dough. Roll dough lengthwise and cut into 18 pieces or roll from short end and cut into 8 pieces. 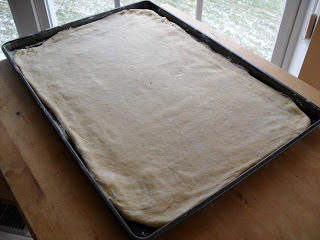 Place rolls about 1 1/2 inches apart in a greased 9 x13 inch baking pan. Cover and allow to rise until doubled, about 1 hour. While the cinnamon rolls are baking, make the icing. In a medium bowl, mix remaining 4 ounces of softened cream cheese and 2 tablespoons unsalted butter until mixed well. Beat in confectioners sugar until thick and creamy. Slowly beat in milk and vanilla until smooth. Drizzle over warm rolls. Working the cream cheese into the dough like that is definitely intriguing! I’ll have to try this out.